The first time through, I read hungrily yet hesitantly, wanting to know, but not. The first time through, I had to stop after the chapters called “Kreacher’s Tale,” “The Silver Doe,” and “King’s Cross” because they were so earth-shattering, my mind couldn’t continue for its racing. The first time through, I sobbed over Dobby’s sacrifice, but not over Harry’s, because I felt in my heart – or maybe I wished – that there had to be a happily-ever-after in store for him after all he had endured and learned. This time it was different, of course. I started with “Half Blood Prince,” because I’d read all the others at least twice, some many more times, but not “Half Blood Prince” and not “Deathly Hallows.” This time, on reading HBP, I cried at the shocking part, because I knew it was real, he was gone. The first time through, I was waiting for the twist that never came, sure that Mrs. Rowling meant a different reality to reign. It was much more poignant this time around. 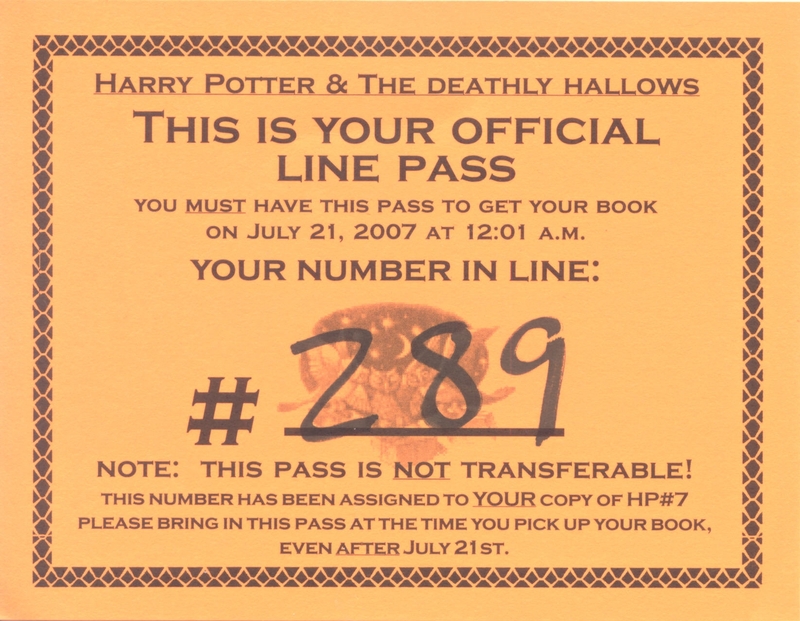 This time I got to move right from HBP onto DH without having to wait the eternity it seemed to take her to write the last chapters of the final book of the saga. What a relief! This time, I read DH more carefully, noting a few – but not many – details I missed the first time around and marvelling at the plot twists and turns that I had forgotten in the years since my last read. This time, fewer tears were shed over Dobby, though that chapter will always have a soft spot in my heart. But this time, I did cry over Ms. Rowling’s favorite chapter of the series, “The Forest Again.” In it (or just before it), she clearly points out that Harry must die, a not-so-minor detail I missed in my haste to learn his fate. And Lupin and Tonks – yowza. Get me some tissues. Last year’s shock turned into this year’s sorrow. But the fiercest tears were reserved for Harry’s use of the Resurrection Stone. Lupin again, and James, Lily, and Sirius (STILL not a character I like) – but curiously, no Dumbledore. I’ll have to explore that omission in the discussion boards at The Leaky Cauldron someday. Even knowing what was coming – or perhaps because I knew – the tears flowed. Little details of plot and battle came clear, made more sense this time. And finally the epilogue – truly one of my favorite parts of the entire series. So much like real life, circles within circles, history laughingly, lovingly repeating itself. Say what you like, but Ms. Rowling is a genius and the world she created, a classic. I will be re-reading this series for decades to come. Emily, who just turned 9, has already read the entire series – 3 times in the last year! And Megan, who just turned 7, is three quarters of the way through Sorcerer’s Stone for the first time. It will be interesting to hear how their perceptions of the books change as they get older, if they ever choose to share that information with me. 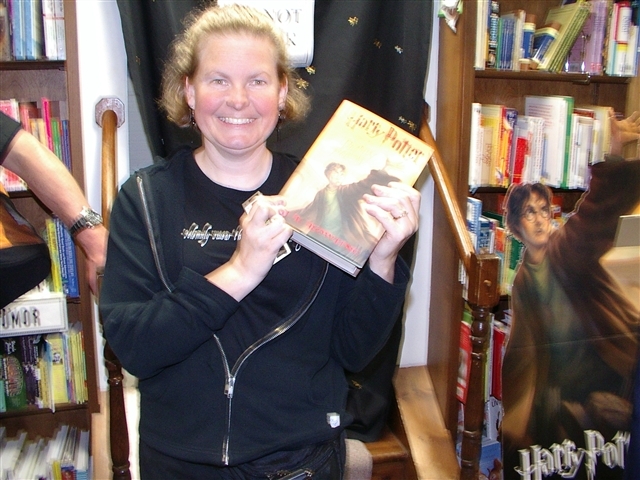 For now, I bid farewell to Harry and his world for a few short months when the movie adaptation of HBP comes out!